Germany's new Chancellor, Angela Merkel, took two loud and clear messages to the European capitals she visited this week. The first was that Europe must swallow tough economic reforms or lose the battle of globalisation. The second, addressed to EU leaders, who have let their recent meetings descend into public slanging matches, was: Stop squabbling and work together! For a diplomatic novice her first outing was a masterly display of firmness with tact. Mrs Merkel has already shown herself a formidable new force in European politics. On Wednesday, she was met in Paris by French leaders determined to show that the "Franco-German axis" was still the engine of European progress. President Jacques Chirac kissed her hand in the old-fashioned way - kissing the air just above it. He said he was grateful for her choice of Paris as her first port of call, and claimed it proved that the two countries' partnership was at the heart of the European political machine. Mrs Merkel spoke of "close and friendly" relations with France but signalled that the relationship would no longer be exclusive or specially privileged. It could be the end of an era, and the start of a more balanced political culture within the EU. The French president is now much weakened. He has been unable to say how he proposed to get out of the European cul-de-sac he entered when his referendum on the planned European constitution was rejected by French voters this year. And the recent rioting by deprived ethnic minority communities in French cities is no advertisement for the French "social model". Mrs Merkel deftly called on Mr Chirac to join her new Germany as a partner in a new European project - liberal economic reform. Without it, she said, Europe's social model would be lost forever. But in each of these areas, France has dragged its feet, preferring protectionist solutions to the perceived hardships of allowing more open competition. Next, Mrs Merkel visited the Nato headquarters in Brussels. It symbolised her Atlanticist beliefs, and determination to repair relations with the US that she says were damaged under her predecessor, Gerhard Schroeder. She delivered this message plainly: Nato must be the place where Europeans go, she said, to decide on matters of international politics and security. And she announced her core belief, that Europe should work with the US, not against it. 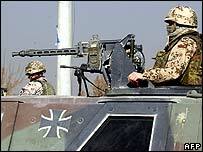 But as expected, in view of strong popular antagonism in Germany to the Iraq war, she confirmed that German soldiers would continue to carry out training of Iraqi security forces in other parts of the Gulf, not within Iraq's borders. Next, at the European parliament in Brussels, Mrs Merkel showed off her integrationist European credentials. She said Germany would do all it could to have the European constitution adopted, but gave no details or timetable for achieving that goal. At the European Commission, the heart of the EU machine, she delivered what she called her main "message": Europe must see through painful economic reforms, or lose the economic power to pay for its cherished welfare systems. Perhaps equally importantly, she called on her fellow EU leaders to stop the blame game - that is, to stop quarrelling and work together more constructively to resolve Europe's "deep problems". She hinted that she might play the part of a bridge-builder between rival camps in the row over the future EU budget, helping to broker a settlement. She acknowledged that for new member states like Poland a budget deal was urgently needed to help them put their modernisation plans into effect. Britain hopes to break the budget deadlock at a summit meeting in December, which Tony Blair will chair. The UK and a handful of other EU states want a phase-out of European farm subsidies to be agreed over the coming seven-year budget period. France and many others say an old accord on subsidy levels, made in 2002, must be maintained until 2014. Germany is the biggest paymaster into the EU coffers and could become an honest broker. The German chancellor has at least sweetened the tone, by refusing to repeat the jibes and public attacks against the British rebate made by Mr Schroeder in the past. The rebate, she said, was one of several big problems in Europe which should be solved together. In London, the chancellor again declined to say which side she was on. 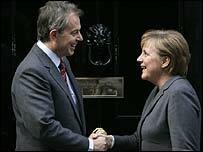 But she seemed to cast aside 40 years of German doctrine on Europe when she declared that for her, Germany's relations with Britain were "equally friendly" and important as those with France. She announced that Germany and Britain would resume annual policy meetings of the two governments, bringing together all the ministers of both sides to co-ordinate decisions more closely. It could all add up to a quiet revolution. In her first two days Mrs Merkel had added a lot to the European mix: Atlanticism, economic realism, a call for tolerance instead of the blame game, and a special concern for the new member states of former Eastern Europe. She is to visit Poland on 2 December. Mrs Merkel heads a shaky coalition at home in Germany. But she is on the way to winning respect as a reliable partner for all sides in a fractured Europe. If she can keep it up she could indeed help to mend the damaged fences inside Europe and across the Atlantic.